This section contains information related to Blue1, flight code KF, a low-cost carrier full-service type. Blue1 started out as Air Botnia in 1988. The company's main routes were on the Finnish market to/from Helsinki. 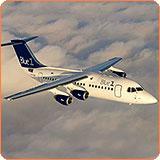 In the year 1998 the company became a fully owned subsidiary to Scandinavian Airlines System. In 1999 a decision was made to change the airline's strategy, and so the network basically was to cover the SAS Group Scandinavian hubs Oslo, Stockholm and Copenhagen. Later that year, all flights entered a code share agreement. The aim was to offer direct international flights. Blue1 and SAS united their organizations in March 2000. In the year 2004 Air Botnia became Blue1. In 2004 they joined Star Alliance and opened the first domestic flights from Helsinki to Oulu and Kuopio. Blue1 continues its expansion program in March 2006. The amount of destinations will grow from 14 to 25. Blue1 will focus heavily on Europe with daily connections to such destinations as London and Warsaw and with flights to tourist destinations in southern Europe such as Athens and Rome. Click to view the original company history in a new window. Click to browse to the network development section of this site, featuring more more information on the network development of Blue1.